The club would also be delighted to hear from anyone who may be able to offer further information on Wallsend Harriers for the years between 1920 and 1952. If anyone can help, with any such material – however small – please contact the Club Secretary. This short history celebrates 30 years of Wallsend Harriers, 1975 – 2005, yet the club was first established in 1920 – two years after the end of the First World war. Wallsend at that time would have been a heavily industrialised town, geographically separate from the city of Newcastle to the west. Among the ship-building, coal-mining and engineering, and a heavy slice of Irish immigrants in the town, organised athletics first stirred on September 22nd 1920. It was then agreed we join the Guild and the Durham Paperchase League and that Mr G Allinson be our representative. A Vote of thanks was moved to the Directors of the Stadium for their kindness in granting the use of the rooms for dressing purposes. Runs to be held on Wednesday nights commencing eight p.m. 16 members were enrolled. The so-called ‘Tyneside Stadium’ was, in fact, no more than a former Ice Rink that had first opened in 1910 just off Wallsend Green, next to the Allen Memorial Church. As an ice rink – ‘the largest in the North’ as it proclaimed – it failed to flourish, and during the 1914-18 war the building – essentially a large hall – was used, apparently, to construct aircraft. After the war, it was used as a boxing hall, in which capacity it would have existed at the time the Harriers were founded. The link between boxing and athletics is not difficult to see. Two years after the formation of the Harriers, in 1922, the building was taken over by Daimler and used as a car factory, but from 1926 onwards it became the property of the Ministry of Labour, and then later the DHSS. It remained in this capacity until it was eventually demolished in 1986. New housing now occupies the site, appropriately named Stadium Villas. Following the demise of the ‘Tyneside Stadium’ it appears that the Harriers moved headquarters to a series of local pubs and halls. Details of these inter-war and post-war years remain somewhat sketchy. There is some extant first-hand material from the immediate post-war years. In the December 1987 edition of ‘The Harrier’ – the club’s newsletter of the day – a report was offered of the reminiscences of Ernest Appebly, 79, and his memories of the club in the 1920’s. Ernest was persuaded, against his better judgement, to join the club by a friend, even though his older brother, Bill Appleby, was already a member. Very quickly, it became clear that Ernest possessed some serious talent did brother Bill who’d won the Northern Junior XC title, as a Wallsend runner, at Blackpool in 1927. The Wallsend ‘strip’ of the time was a long-sleeved vest of black and amber, with a diamond-shaped crest on the front left. White shorts, with standard footwear of sandshoes from Woolworths. Ernest remembers the training regime to be mainly low-mileage, with minimal training between racing, and annual fees to be 2/6d (12.5p). Club headquarters were at McDonalds Cafe, outside Swan Hunters shipyard, until moving to St Lukes Church Hall, and thence to the Comrades Club on Station Rd. Training was Tuesday and Thursdays, with a Sunday run from Mr Bowran’s farm on the old Coast Rd. His memory is of ten mile training runs, with a series of sprints at the finish, under the auspices of an ex-professional runner, Norman Hutchinson. He also remembers competing against Elswick Harrier’s Alec Burns, who later represented GB at the 1934 and 1938 Olympics, as well as taking part in such long-distance relays as Sunderland to Catterick. He also remembers other Wallsend runners, Frankie Bloor and Bob Charlton, who later helped to form Jarrow & Hebburn AC. A detailed chronicle of this period of the club’s existence is yet to be written, but the evidence suggests that this first incarnation of an athletics club in Wallsend folded sometime in the 1950’s. Margaret Watson, a senior local official, was a young athlete at Heaton Harriers at the time and remembers a number of former Wallsend members coming over to Heaton by default. These post-war years were difficult times for athletics clubs -international representation was largely the preserve of Oxbridge students, and provincial, urban clubs were often the refuge of a hardy, but few, devotees. Wallsend Sports centre was newly opened in 1972, on the site of a former colliery and community of Bigges Main. The incumbent manager, Billy Bell, keen to see athletics find a place at the new centre, placed an advert in the local press asking for volunteers to set up a club. Bill McGuirk, a former top-class local runner (1.53.8 for 880yds) stepped forward and began to coach group of youngsters in 1975, naming the club Wallsend Harriers. Of all those connected with the club in these early days, few would deny that the influence of Bill McGuirk was both essential and unmatched. His energies and his leadership shaped the club in it’s infancy and he quickly set about amassing a squad of genuine home-grown talent. Youngsters were drawn to the coach’s drive and wisdom – but it was also the spirit of camaraderie that Bill engendered that held the lads, and the club, together. In it’s early days, this new club was primarily, a club for young athletes. It was not until 1978, three years after Bill established the club, that the club’s first senior road-race champion – D Waterson – was crowned. In 1979 the club moved their headquarters to Burnside School in Wallsend, after disagreements at the Sports Centre, and remained at that school until returning to the Sports Centre nineteen years later in April 1998. So what kind of club are we? After seeing the club through the critical early years, Bill’s stewardship of the club began to be passed onto other willing hands. The mid 1980’s saw two significant changes in the committee structure of the club, when good friends Terry O’Gara and Gordon Smith took a more prominent role within the club. Terry took over as Secretary and Gordon as Chairman (with Bill as senior coach and George Page as Treasurer)) and both set about developing the club along very clear lines. Terry had become involved with the club initially as a parent, when son Stephen and daughter Kerry showed an interest in the sport. It wasn’t long, however, before Terry’s fiercely competitive nature and natural sporting abilities – he’d played local football for many years – found him involved as a competitor as well as supporter. The late 1970’s and early 1980’s were unprecedented years in terms of popular interest in athletics. The ‘jogging’ boom had spread from America over to Europe, and this, coupled with a more general social concern with individual health, had led to huge numbers of previously inactive people taking up running and jogging. Races proliferated in an effort to cope with this sudden boom, often inspired by the success of high-profile events such as the London Marathon and the Great North Run. Inevitably, athletics clubs discovered a surge in interest. Ironically, this boom in the sport of athletics was in stark contrast to the general economic health of the country. For much of northern Britain – the previous industrial heartland of the country – the 1980’s were a period of decline and economic disintegration. These were the infamous ‘Thatcher’ years, when manufacturing industries in particular faced closure, cutbacks and recession as the Conservative government of the time sought to achieve prosperity through rigorous and brutal free-market economics. Against this background, Gordon and Terry began to imprint a distinctive mark on the club. Both were skilled workers in traditional heavy industries, both had an acute sense of the social and communal benefits of sport, and both had the famous Geordie values of ‘work hard, play hard’. So it was, that under the example and leadership of these two, Wallsend Harriers began to develop an envied reputation for fierce competition coupled with a love of the post-race drink and a care for the welfare of members and families. Some local races in particular were cherished as much for the excuse to have a bit of a drink and a laugh afterwards as they were for their athletic challenges. The midweek Newbiggin race in the Spring often left many a runner exhausted by a session with Gordon in the ‘Bank Top’ social club and the sing-song with Terry on the hire-bus going home, as much as the effort of running five miles. Similarly, the Tynedale 10k in the summer, the Great North Run, (with the post-race meet in ‘The Ferry’), the Blaydon Race, the New Years Day ‘do’ after the Morpeth, and the club’s own presentation night and Christmas parties were among other social occasions which consolidated the club’s reputation as a friendly, open and welcoming club. This spirit was vital in attracting and retaining membership of the club. Lacking any specific athletics facilities – the club was still based at Burnside School – and with few specialist coaches in any field events, the club nevertheless reached out to perform respectably in all three athletics disciplines; track & field, road-running and cross-country. ‘Subs’ were kept as small as possible, the unemployed weren’t pressed to pay, and many members found themselves in receipt of financial assistance when faced with travelling or unexpected costs. Athletes who chose to leave for other, more high-profile’ clubs, would often mourn the loss of comradeship and friendliness which had been so evident to them at Wallsend. Meanwhile, Gordon and Terry kept the club bouncing along in a genial mood of friendly encouragement, mickey-taking and laughter. That isn’t to say that the club was not ambitious for success. As the youngsters who’d joined the club in the boom years began to grow into senior runners, so Wallsend’s athletic success began reach beyond the north-east. The 1990’s, for example, saw some high-class performances in national road relays. It’s always been a Tuesday and Thursday night, and it’s always been ‘about 6 o’clock’, and it’s every week, all year round. No subs to pay, no registers, no obligations – just come along and go for a run. And that would be anyone – new members, strangers, old members, friends, visitors. To turn up was to be included. There have always been some at the club who are there every training night – the real die-hards, the real core runners for whom the club nights provide a welcome focal point in a week of work and family demands. There are members who turn up less frequently, and members who can sometimes be seen for weeks on end, only to then disappear again as injuries, families, shift patterns break the habit. No matter – there was always a welcome, a smile of recognition and an invitation to come for a run. One of the club’s basic commitments on training nights is that no-one is ever left behind, drummed into members by the likes of Terry and Gordon shouting ‘put a loop in!’ to those drifting off ahead. This has been vital in making new members welcome – on winter nights there can be nothing more dispiriting for prospective members than to see experienced athletes scuttling off into the darkness and unfamiliar streets. Whatever the standard, at Wallsend there’s always someone willing to wait for the slower or new runner. That’s not to say that training nights are not competitive! For years, Tuesdays have always been the more demanding sessions, and it is common to see those in attendance breaking up into informal groups – the ‘fast lads’ and ‘the rest’ is usual, but at its peak there could be three or four separate groups heading out into North Tyneside, each with their own ‘session’ planned by one of the group, or suggested by Bill McGuirk during the years he actively coached. This informal division into smaller groups was not without it’s opportunity for mickey-taking – ‘howw, look at him off with the fast group – they’re too sharp for you, man’ or a mark of achievement – ‘get yersself off with the fast lads next week, bonny lad, it’s what you need.’ Sessions can be as varied in location and type as can be imagined, from gentle long runs ‘up the pit heap’ to eyeballs-out efforts doing ‘Chilli – Churchill.’ Hill sessions at Swans Bank, Church Bank or the ‘Bogie Chain’. Fartlek runs through Jesmond Dene, abuse-dodging runs along ‘the bottom road’ in Walker, ‘efforts’ down by the old Boneyard; long, long runs (especially with Smudger!) up through Backworth, Killi Village and Forest Hall, ‘out and back’ to North Shields, etc. 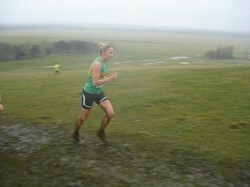 Runs to suit all types, all situations, all-weathers. And always a constant patter of encouragement, advice, urging, mickey-taking, abuse, gossip and race reviews (or previews) as the groups move along, shifting patterns and positions. We do a lot as a club: we compete, we organise, we drink, sometimes we argue and usually we have a laugh, but it’s the Tuesday and Thursday training nights that are the life-blood and soul of the club. Sometime in 1982, at a time when the local race calendar was rapidly expanding, the decision was taken for the club to organise and stage their own road races. With a date in May, a course was put together that took athletes from Wallsend Sports Centre, up Station Rd to Whitley Road, then down Coach Lane, along Appletree Gardens and back into the Sports Centre. The course was measured at 10k, and there was supporting programme of age-group races and even, in the early years, a fun-run. The international runner, Ray Smedley, was the first winner in 1983, with the club’s John Lucas taking the U17 title. The race has continued without a break ever since, with only minor modifications to the course. It took until 1999 for Wallsend to provide a home-grown winner of the race, when veteran Peter McDaid triumphed – only for Wallsend athletes to win in two of the next three years – Stephen O’Gara in 2000 and Ivan Hollingsworth in 2002. The race remains a vital source of revenue for the club, even if the numbers entering the race have declined over the years, and the race is still held in the first two weeks of April every year and remains a significant forum with which to maintain the club’s reputation for staging well-organised events. Changes in social trends, and the growth of the retail trade on Sundays, had seen the start of the race moved progressively earlier in an event to minimise disruption, but the 2006 road race was, however, to be the last on the well-established 10k course. Despite support from local police at Alexandra st in Wallsend, the so-called ‘Safety Advisory Group’ – a permanent sub-committee including representatives from the police, the local authority and other parties – recommended that the club find an alternative race-route, citing the number of junctions on the course as the grounds for concern. After much-debate within the club, against the background of a unanimous decision to maintain some sort of club-promoted event, it was finally agreed to develop a new race route using the off-road tracks of the Rising Sun Country Park. This area was formerly a colliery site and occupies a huge swathe of land behind the Asda store in Benton, North Tyneside. 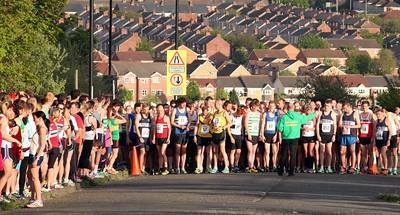 A 5-mile, multi-terrain race was devised and the first event in 2007, saw Wallsend determined to maintain a proud reputation for staging well-marshalled, well-organised race. 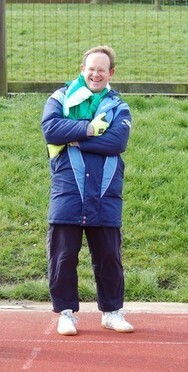 This reputation was further enhanced over the years by Wallsend’s annual promotion of one of the winter North-East Harrier League cross-country fixtures. Held in and around Wallsend Burn, the race enjoyed a notoriety for the toughness of the event, as runners climbed a succession of challenging hills in the area, with one particular hair-raising descent at speed to cross the Burn before scrambling up the other side. Despite the popularity of the meeting among cross-country aficionados, an unfortunate accident (ironically in an area otherwise considered safe – the run-in to the finish) when a young athlete was injured, forced the League to ask the club to revise the course. – without any hills! Given the physical geography of Wallsend Burn, this was an almost impossible request, Wallsend lost the fixture and the League has been forced to look elsewhere for willing host clubs. 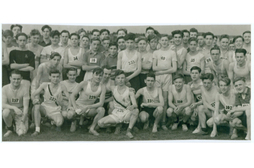 For many years, the club also promoted a further cross-country event – the ‘Post-National.’ This race was always on the Sunday following the ‘National’ championships in an effort to give local runners a chance to compete on what be an otherwise empty weekend. This meeting was for senior and veteran runners only, and was staged up at the former Rising Sun pit-heap. Unfortunately, declining numbers of entries have lead to the sad demise of this event. On the other hand, in 1996 the club staged the first of their ‘Gordon Smith Memorial Relays’ in honour of the recently departed former club chairman. Offering a mixed-age relay combining senior and veteran athletes, entries have been consistent and the event is well-supported by many local clubs. Held on a Spring May evening, it was initially staged in St Peters Basin, but the last two years have seen the event moved to utilise part of the Hadrians Way Cycle Path close to Swan Hunters shipyard and the Segedunum visitor centre. Using the ‘Ship Inn’ as race headquarters gives the club to opportunity to carry on in Gordon Smith’s spirit, mixing a love of running with a post-race pint or two, and the 2005 event saw 36 teams of three runners start the race. Apart form these ‘open’ races, the club also has a series of internal competitions. The annual club championships, held in April each year, have traditionally been the most prestigious of such events, while the ‘Johnstone Cup’ has long history. This is a ‘yacht handicap’ event and was first held in 1985 (this race has now been re-named the ‘Doug Bramley Cup’, as a permanent memorial to one of the founding members of the club who died early in 2005). Recent years have also seen the establishment of both summer ands winter Grand-Prix series, both handicap events with prizes to overall winners. On January 1st, 2005, Wallsend staged their inaugural ‘New Years Day Handicap’ race – a direct response to the disappearance of the popular Morpeth-Newcastle road race that had traditionally been staged on that day. A five-mile, yacht handicap, starting and finishing at the Sports Centre, it’s long-term future may depend on the outcome of recent efforts to restore the ‘Morpeth’ to it’s well-established date. Cross-country running perhaps embodies the ‘harrier’ tradition better than any other athletics discipline, and it therefore not surprising that some of the club’s greatest achievements have been over mud and grass. With rewards going to the strong as well as the swift, cross-country gives ample opportunity for the brave and the determined to succeed. In 1979, only four years after the club was re-formed, a Wallsend runner picked up the club’s first individual championship success when Tony Patterson won the North East Boys XC title at Middlesborough. “Patter”, as he was known, was something of a one-off, a natural showman, and he was revered within the club for his exploits, his ‘flash’ kit and his superb performances. Patterson’s emergence as the club’s most significant runner at that time superseded the previous unofficial ‘club number one’ Gary Tully. North-East Boys titles in the late 1970’s did not come cheaply for Tony Patterson, or any other potential winners, as the competition was fierce and of an exceptional standard. Tony Patterson continued to enjoy local and then national success in Wallsend colours. In 1980 he won the North of England Boys XC Championship at Durham, and, as he moved up the age-groups, collected the ‘double’ in 1981, winning the North-Easterns at Darlington and the Northern Youths title at Birkenhead. 1983 was perhaps Tony Patterson’s finest year. A top 30 finish in the Junior race at ‘the National’ in Luton, on top of consistent success at local level, earned him selection as reserve for the England Junior XC squad for the World XC Champs. Although technically ‘non-travelling’ reserve, Tony still watched the race, as the Worlds were held in Gateshead that winter. For Wallsend Harriers, 1982 witnessed the dramatic arrival at local level of perhaps the club’s most outstanding athlete of that era – John Lucas. Although specifically a track runner, John bravely held off a host of international-class athletes to win the 1982 North Eastern Youths XC title at Durham, run over four miles. In Lucas can be seen, perhaps in it’s most pure form, the product of Bill McGuirk’s coaching philosophy. ‘Championships,’ he would say ‘are what it’s all about. Cross-country in the winter to make you strong for the summer.’ The patient Lucas, primarily focused on the track season ahead, was a willing disciple and his cross-country success was almost an incidental by-product of his meticulous preparation for the summer. Cross-country success for Wallsend continued in other competitions. In 1985, the stylish and youthful Chris Naisbitt won the Sherman Cup, an era when there were no easy races and local events would often see international runners such as Charlie Spedding, Mick McLeod, Kevin Forster, Geoff Turnbull and Barry Smith competing. 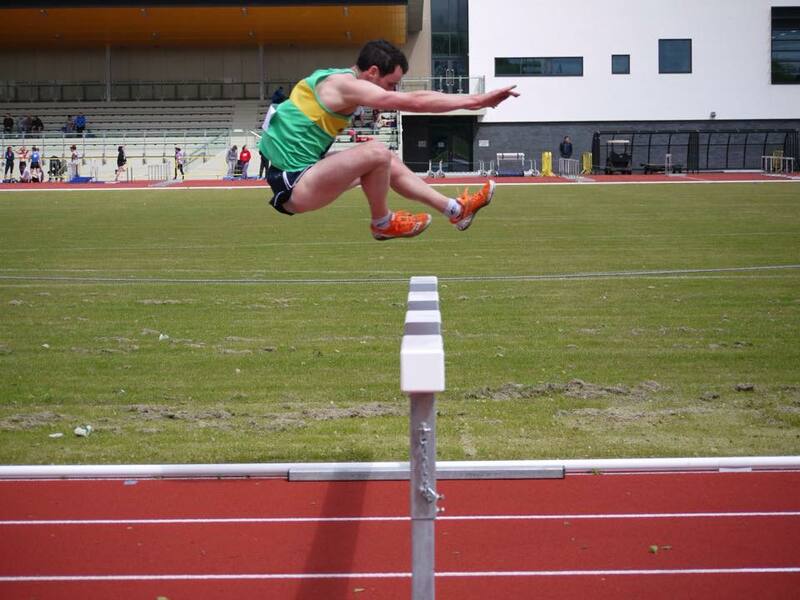 The following year, another hugely talented Wallsend runner made his mark at regional level. Tony Smith finished 5th Junior in the Northern XC at St Helens, and his success was reflected in his determination to challenge John Lucas for supremacy at the club. Tony Smith was brash, arrogant and as hard as nails, a fierce and uncompromising runner who gave his best in every race. Smaller in stature than the tall, leggy Lucas, Tony Smith was one of the most promising athletes ever to wear the Wallsend colours. The National XC in 1985, held on a snow-covered Newcastle Town Moor, saw Tony finish a superb 15th in the junior race. Collective, rather than individual, success for Wallsend in XC finally arrived in 1987, when the senior squad of Colin Atkinson, Paul Merrison, Dave Milligan, John Lucas, Paul Brannigan and Nick Fields finished third in the North-Eastern XC at Sunderland. Almost all of these runners were home-grown, local runners from the North Tyneside area, taking on and competing with the best in the north-east. Not all stayed with Wallsend, or even with the sport. Of that six-man XC team, Colin Atkinson moved to Elswick Harriers, returned to Wallsend, then took up competitive mountain-biking. 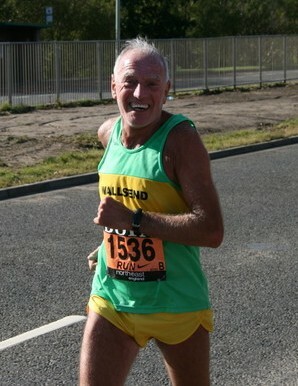 Dave Milligan can occasionally be seen running in Wallsend, but has struggled bitterly with a succession of crippling injuries in recent years. John Lucas is now a successful businessman. Paul Merrison is the current Wallsend Harrier Athlete of the Year, is still enjoying success at local, national and international levels as a veteran athlete, can still run the 3000m SC in less than 9.55, and teaches in North Tyneside. Nick Fields was last heard of in Bolivia in the early 1990’s, after he and his wife, apparently, ‘just upped and went’. Paul Brannigan was also a brilliant track runner and was recently still competing as a fell-runner. He currently lives in Lancashire. If 1987 was notable for the first-ever team honours for Wallsend in XC running, when the senior runners finished third in the North East Champs at Sunderland, the same year also saw a just as significant success for the Youth squad in the Harrier League series. The six-race series is always difficult to win, and with a squad comprising Andrew Brookes, Steve O’Gara, Stephen Bell, Sean & Gerry Maley, and Darren Clarke the club could draw upon schoolboy county champions to join other Youth runners such as Darren Graham, Steve Barnett, Dave King, Flint Finlay, Scott Robinson, Alan Mallaby, Mark Fletcher and others. It would be another five years before team success in XC running came Wallsend’s way – although this time it would be gold. The four-strong Youth squad of Lee Morgan, Phil McCartney, Paddy Wilson and Tony Murray romped to triumph in style at the 1992 North-East XC Championships. Individual success followed in 1993 when Paul Morgan, Lee’s older brother, won a superb Northern Junior XC title at Pontefract. The powerful, relentless, strength and action of Paul Morgan was evident in all running disciplines, but this XC success on a windy day in South Yorkshire was perhaps his finest hour, as he raced to victory ahead of Kevin Farrow, a recent UK international runner. Paul had, incidentally, finished only fourth in the North-Easterns prior to the race, but continued his excellent form to finish just outside the top ten in ‘the National’ that year. The 1994-95 cross-country season was a winter of now-legendary heartbreak for Wallsend, as they were controversially robbed of the overall NEHL series title. After a good opening two fixtures in the series, with high finishes for the senior team, a rallying call from Terry and Gordon brought out the club’s ‘top guns’ (who might otherwise have chosen to miss the Harrier League) in an effort to clinch the series. By the final fixture of the season, at Prudhoe, Wallsend needed only to beat Sunderland Harriers by a couple of points to secure the title. Miles ahead at the three-quarter stage, everyone at the club was convinced that our day had finally arrived. With such a strong pool of senior runners, many of whom had come through the ranks as youngsters, Wallsend were beginning to rival bigger clubs in the area during the mid-1990’s, and in the 1996 North-East XC Championship, Lee Morgan led home the Wallsend seniors in a thrilling race at Willington with a 7th place finish. The club just finished out of the team medals, by the smallest of margins, with a fourth place in the closest-ever local Championships. It is a race which still haunts Steve O’Gara who, by his own admission, had his worst-ever ‘pressure run’ for the club. Had he run to form, he is convinced Wallsend would have won gold on that winter day in Weardale. These were, however, good years for O’Gara – free of injury and back from university, he ran consistently well and became Wallsend’s first-ever senior runner to gain international selection when he ran for England in the home counties international XC race, finishing a superb fifth. 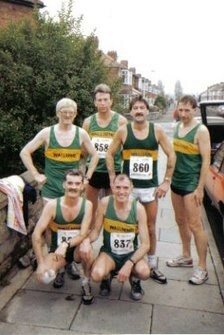 By 1999 many of those runners who had represented Wallsend so honourably as senior runners in the 1980’s had progressed to the veteran ranks, and XC veteran success was soon to come Wallsend’s way as the quartet of Peter Saint, Paul Merrison, Peter McDaid and Tom McPhail travelled down to Norwich for the National Veterans XC Championships and romped to team gold, with McDaid (the ‘flying doctor’) collecting an individual bronze for his third place. This then led to international representation for the Whitley Bay doctor, as he ran for England M40’s in an international fixture. 1999 also saw Sonia Thomas, in one of her last races as a Wallsend runner, complete a trio of medals in the National XC, as she raced to the gold medal in the U20 race at Newark showground. Sonia had also picked up, in earlier years, a silver medal as an U15 and a bronze as an U17, and had represented the UK in both the World and European XC Championships. Sonia, at the time a full-time student at Loughborough, now runs in the colours of Sale Manchester Harriers and has recently been seen competing over the womens steeplechase. IN 2000 there was multiple success for Wallsend in cross-country running when youngster Nathan Shrubb gave the club it’s first success at youth level for many years when he raced to victory in the North East XC U13 race at South Shields. This was added to that year when a Wallsend runner deservedly gained international selection in cross-country, as Paul Merrison collected an England vest running for the M40 team in an international fixture. Paul Merrison has continued to represent the club with great distinction as a cross-country veteran runner. A top 20 finish in the senior North-Eastern championships in 2004, winner of the North-East veterans XC title and further international honours in 2003 and ‘05 have been just reward for Paul’s huge talent as a cross-country runner as he demonstrates an unparalleled longevity at the highest levels of local athletics. Paul’s success continued into the first decade of the new century. During the winter of 2005-06, for example, he won the NE Vets M45 title and finished just outside of the top ten in the international vets cross-country fixture in Dublin. The winter North-East Harrier League still continues to motivate the club. Recent club captain Mick Baker cajoles and nags runners to compete every winter, and helps focus many runner’s attentions on the annual, internal, Harrier League Grand Prix (with it’s historic, but arcane, scoring system) and the club has retained it’s Division One position for many years, finishing an excellent third north-east club in the overall series in 2004-05. The burgeoning womens group at the club also began to achieve cross-country success. IN 2005-06, Lisa Walker repeated her success of the previous year in finishing second overall in the NEHL series. There were also individual wins for both Danielle Hodgkinson and Joy Fenwick in NEHL races. The past 30 years have been marked by some superb, occasional, XC success for such a small club as Wallsend, much of it due to a host of talented youngsters who came to the club during the ‘boom’ years of the 1980’s. Chris Naisbitt retains the honour of the highest-ever finish for a Wallsend runner in the senior ‘National’ and runners such as Davy Johnstone and Paul Brannigan (at Prudhoe) and Dave Milligan (at Wallsend) have recorded individual victories in NEHL fixtures. 4) Some of us run and run and run and run! It may be an esoteric discipline, but running for hours and hours does have its adherents! Mention ultra-distance running to anyone connected with Wallsend Harriers and one name immediately springs to mind – Paul Bream. He wasn’t the only person to try this sort of thing, but he was by far the most successful. s disbelieving passengers caught up with Paul. His first ‘ultra’ was in 1986 in the Lincoln 100k and the following year Paul set a UK 24-hour record, running 158 miles 905 yards in Eire, a record that, 19 years later, still stands. In 1988 he was ranked number 1 in the world for 24-hour running, and he celebrated his 50th birthday by running the 1995 London-Brighton race, finishing 6th overall and 3rd UK finisher. Choosing not to run the Comrades race (“I’d have nothing to do with South Africa while they had apartheid!”), Paul was an active trade unionist. However, injuries, age and the rest of his life began to see Paul running less and less. Now approaching 60, he still runs in ‘fits and starts’ and is still thinking of a comeback, and still lives in Wallsend. For a typical ‘harrier’ club such as Wallsend, road-running is perhaps the most natural consequence for groups of runners who meet regularly to train. Along with cross-country running, it is a step most runners take after joining a club and building up a consistent level of fitness. For Wallsend, road-running has provided some of the greatest achievements over the past 30 years, as athletes of all ages made their mark at local and national levels. Under Bill McGuirk’s initial leadership, the club was essentially for young runners in the late 1970’s, but as the club blossomed and began to share in the benefits of the running and jogging boom of the early 1980’s, talent began to emerge from the hundreds of youngsters attending the club. Racing on the roads was a feature of the club right from the start. Bill McGuirk’s early record books identify different, measured, courses starting and finishing at the Sports Centre, ranging from 1.5 miles to 6 miles. The first, club-only, race recorded by Bill was on October 7th 1975, when young A. Watt won a 2.75m Boys Yacht Handicap, recording the fastest time of 16.35 minutes, ahead of a field of eight runners including S Bramley, A McGarvie, D Patterson, J Walsh, J Henderson, P Naisbitt and M Pearson. Races for ‘Youths’ and ‘Seniors’ (as the age-group categories were then known) were to follow. It was during the 1980’s that the road-racing circuit in the north-east began to massively expand, as local clubs reaped the benefits of increased membership as a consequence of the ‘jogging’ boom. This was the heyday of road-running – perhaps never to be seen again – as businesses and local authorities leant money, resources and support to all types of running events. With huge levels of participation, road races forced the closure of roads, forced traffic to be diverted, brought city-centres to a halt in a manner that can only be envied by modern race-promoters. Television also jumped quickly onto this ‘new’ sport, with sponsored city-centre mile races, for example, given prime-time coverage as running in the UK enjoyed an unprecedented high profile. A number of factors were at work – the success of international distance runners such as Coe, Cram, Foster, Bedford and Ovett, the marathon successes of Spedding, Forster, Hutton, Steve and Hugh Jones, Barry Smith etc, allowed the UK to seem competitive at all distance events, while the other ‘national’ sport – football – was enduring it’s lowest-ever point. This was the age of Heysel, Bradford and Hillsborough, before all-seater stadiums and before the money from satellite broadcasters attracted international talent into domestic football leagues. The 1980’s were also the time of a re-discovered, and occasionally government-led, focus on personal health. Heart disease, from diet and smoking, was a major killer, work for many people was becoming sedentary and desk-bound, and adults were now encouraged to re-discover sporting activities – previously considered something only done during childhood and youth. This was also, perhaps, the last generation of young people from the lean decades of the post-war era. We were, as a society, much thinner than we are now and most children were accustomed to playing outdoors, not distracted by computers, play-stations, internet and 24-hour television. This was fertile ground to develop the habits of distance running and Wallsend Harriers were among those clubs reaping the harvest. Prominent among them was John Lucas, who became Wallsend’s first athlete to achieve international recognition when selected to represent England Juniors on a 1984 tour of Australia and New Zealand (a tour which also included Sally Gunnell among the young athletes). Lucas’s selection was much deserved. Even at this young age, he proved a great tactician and possessed a devastating finish. The 19-year old Lucas had already achieved 50.5 for 400m and had ran a club record of 3.46 for the 1500m. This latter record was to survive for thirteen years! Whilst primarily a track runner, John also achieved some success on the road, and in 1983 – at the inaugural Wallsend road races – John was a winner of the U17 Boys race. In 1987, a young Stephen O’Gara won the Junior Great North Run (the same year his father ran the senior race in 1 hour 12 mins at the age of 45!). Lee Morgan repeated this success for Wallsend in 1992. This success at youth level was not an isolated event. For the duration of the 80’s and 90’s, young Wallsend runners rarely strayed form the ‘business end’ of local road races. Athletes such as Geordie Lacey, Tony Smith, Andrew Ball, Colin Atkinson, Derek Craigie, Dean Lewis, the Maley brothers, Stephen Bell, Andrew Brookes, Paul Morgan, Ian Knox, Phil McCartney, Paddy Wilson, Mark ‘Sparky’ Conway, Paul Brannigan, Gary Tully and the Naisbitt brothers all enjoyed significant success. For 3 years in a row – 1994, 95 & 96 – Wallsend successfully qualified for both the 6 and 12-stage National Road Relays, a significant achievement given both the size of the club and quality of the opposition at that time. These National road-relays represent – for many – the epitome of British athletic club road-racing traditions. Descendants of post-war road-relays such as Manchester-Blackpool, the races are staged at Sutton Park in Birmingham, now an almost spiritual home of club road running. Qualification for the ‘National’ is through an Area championship held four weeks prior, and in 1994 an anxious Wallsend 12-man team scraped through after finishing 16th at the ‘Northerns’ in Roberttown near Halifax. This qualification came after a number of years in which the club had tried, but failed to qualify. At the Nationals in Birmingham, a 12-man Wallsend team of O’Gara, Lucas, Morgan (L), Saint, Morgan (P), McCartney, Milligan, Law, West, Naisbitt, Renney, Robson, brought the club home in an excellent 32nd place. This set the pattern for the next 3 years, as Wallsend demonstrated their ability to compete on equal terms with some of the best clubs in the country over both 12 and 6-stage road relays. Almost like no other competition, these relays became the focus of the club’s attention over the winter months. Trials – run-offs – were held to choose the teams, the trips to the Northerns or to Birmingham were full of laughter and mickey-taking (and skulduggery with Terry’s sweepstake to guess the finishing time) and the results were scrutinised to compare performances. With a rejuvenated Stephen O’Gara, back from University and holding together a large and talented group of ‘strong personality’ athletes (still coached by Bill McGuirk), the club had a core of talented runners that had nearly all progressed from junior ranks at Wallsend. 1995 was the year in which Lee Morgan – at the peak of his abilities – triumphed in both the 5k and 10k NE Championships. To win the 5k title, the audacious and unfancied Morgan out-ran a high quality field that included international runners Terry West and Gary Nagel. A fortnight later, Lee enjoyed further success with triumph at the prestigious Heaton 10k (incorporating the NE Championships), coming close to 30 minutes for the distance and within striking range of the club record. In 1996, the club were runners-up in the NE Road relays (the Signals), while Sonia Thomas won the female Junior Great North Run. In 1997, Chris Smith became the third Wallsend winner of the Boys Junior Great North Run. It was a brilliant and unexpected win for the previously unheralded Smith. The Tommy Morgan-coached athlete soon left athletics to pursue a career in the Armed Forces and failed to develop his considerable athletics potential. In 1998, serving soldier, Craig Haslam, won the NE 10k road-race title at Morpeth. Haslam was a world-class Biathlete, combining shooting with cross-country long-distance skiing, and had – at the time – realistic ambitions of Olympic representation. Steve O’Gara duplicated Lee Morgan’s NE 10k Championship success in 1999, as well as winning a silver medal in Inter-Counties 10k at Birchwood, beating Paul Taylor of Copeland but finishing just behind Swansea’s Mark Morgan. O’Gara also recorded the second fastest time in the North of England 6-stage road relays that same year, only 2 seconds slower than Sunderland’s Brian Rushworth. O’Gara still rates this as one of his best-ever performances – “sub-18.30 for an accurate 4 miles – sometimes you have to fly your own colours!” If 1995 had been the year of Lee Morgan, then 1999 was O’Gara’s year as he threatened to challenge the strongest runners in the area before succumbing to a succession of injuries. By 1999, however, the club was also now challenging for road-race honours at veteran level. Winning the Elswick Good Friday relays in a course record (Saint, Merrison, McDaid, McPhail), as well as the veteran championship in the Signals Relays (the same four, plus Anderson and Murray) – helped prepare Peter McDaid to win the Wallsend road race, becoming the first athlete from the club to win our own race promotion. The following year, 2000, O’Gara followed McDaid’s success at Wallsend, while Ivan Hollingsworth won the Elswick road Race (the Norman Woodcock) wearing Wallsend’s colours. Two years later, Hollingsworth became the third Wallsend athlete to win the Wallsend road races, while Terry O’Gara – now running as an M60 – won his age-category at the Great North Run. In recent years, it is veteran runners who have maintained Wallsend’s reputation in local road races. The likes of Paul Merrison, Tom McPhail, Dave Anderson and Terry O’Gara have continued to pick podium finishes in local road races. There have also been an encouraging level of success from an emerging group of women runners, among them Lisa Walker and Donna Horne. Danielle Hodgkinson, at the time a serving soldier, made occasional visits home in the Spring of 2006, to record a victory in the womens race in the final Wallsend road races on the old-established course, as well as top-four finishes in both the Elswick Good Friday relays and the North Tyneside 10k race. In this latter race, the club also won the womens team title, as both Donna Horne and Lisa Walker supported Danielle’s efforts. 6) We do track and field! While road running and cross-country running can be seen as logical consequences of the type of club that Wallsend represent, track and field athletics is a much less auspicious combination! We have never had a track, we had only primitive jumping and throwing areas when based at Burnside School, we have often lacked basic equipment, and we have never really had specialised field-event coaches. Despite this, track and field athletics – the ‘blue riband’ side of the sport of athletics – has produced some stunning success for such a small club as Wallsend. Some of it occurred almost naturally – Bill McGuirk was a former track runner, some the youngsters he coached in the early years could run fast, some of them were encouraged to ‘have a go’ at track running…running – rather than field events! The first major success to come the way of Wallsend was in 1983, when Paul Brannigan won the North-eastern Junior Mens 800m title, then travelled north to win the Scottish 800m title. The following year, Gerry Maley finished 2nd in the English Schools Junior 800m, while John Lucas was runner-up in the North of England 800m. In 1985, a young Dean Lewis won the NE Championships Junior Mens 3000mSC. Lewis was, according to his contemporaries, the epitome of ‘cool’ – often resplendent in black leather until minutes before the start. 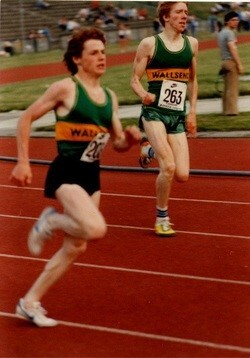 Club Chairman at the time, Gordon Smith, often referred to ‘Disco Dean’ as Wallsend’s most naturally talented athlete. The following year, 1986, John Lucas made a massive breakthrough for Wallsend when picking up a gold in the North Eastern Mens 1500m. This was the triumph towards which Bill, John – and the club – had been working since 1975. Now the club could hold it’s head up in local athletics circles. The influence of Lucas (and therefore Bill McGuirk) among the more talented of Wallsend runners is akin to the Coe/Ovett rivalry of the early 80’s. His range of club records were widely known by others, as was his unbeaten sequence in the club’s road-race Championship. Behind his thoughtful and reserved exterior, however, Lucas possessed the ethos of a competitor of the highest order. Despite challenges from some of his more brash and outspoken rivals in the club, Lucas consistently suppressed claims to his title as ‘club number one.’ Few spectators lucky enough to watch Lucas in his prime can ever forget the awesome acceleration over the latter part of a race as he effortlessly pulled ahead of struggling rivals. His single-minded focus on middle-distance running didn’t make Lucas some sort of prima donna – many is the occasion when he would do his bit for the club by triple-jumping, relay-running or even shot-putting in track fixtures. Such was the club’s strength in depth at that time, that in 1987 the club were ranked 11th in the UK for the McVitties 25 x 1 mile race, with 25 different runners successively lapping the track at the Lightfoot stadium in Newcastle. This was a marvellous and often overlooked achievement, reflecting a depth of quality that few clubs could match, as all but four of the 25 runners recorded sub-5 minute miles. In 1994, the club were ranked 2nd in the UK for the Mens 4x800m relays, when a squad of John Lucas, Steve O’Gara, Paddy Wilson and Paul Morgan sped round the track at Jarrow. This was a massive achievement at national level, and was thoroughly deserved as all were capable of sub 1min 50 secs for the distance. This massive achievement – only one other athletics club in Britain had four runners who’d ran a 4x800m faster that year – was not some sort of freakish one-off; this talented group of runners were only the latest in a long line of highly ranked 4x800m quartets to wear Wallsend colours. John Lucas, Paul Brannigan and the Maley brothers (Sean and Gerry) were, for example, a formidable squad. In 1996, O’Gara won the Scottish Indoors 3000m title, after injecting a 2.02 last 800m, and finished runner-up in the North of England 5000m the following year – again showing his finishing speed with a 26-second last 200m, finishing just behind John Wild of Sale but ahead of international runners such as Paul Green, Paul Freary and Kevin Farrow. Towards the end of the 1990’s veteran runners at the club began to make their mark on the track. Eric Smart was 2nd in the World Vets Championships (held in the North East) in the M40 100m, while Phil Jones (M40 400m) and Paul Merrison (M40 3000mSC) also competed in the finals of their events in the same championships. In 2000, Paul Merrison picked a bronze on the UK Vets championships 3000mSC. That same year, sprinter Craig Telford was controversially robbed of a spectacular victory in the professional Powderhall meeting. One year later, the young Telford recorded the first-ever sub 11 second 100m for a Wallsend athlete (running 10.84 in the U23 Championships at Bedford and thereby becoming ‘Wallsend’s fastest-ever runner’), while Merrison picked up his first veteran track gold medal in the UK Vets championships. Aside from such individual success, the club has also competed successfully in team track and field competition – a much more challenging prospect as this requires athletes who can throw and jump as well as run fast! In 1985 the club first entered the North of England T&F league (then sponsored by Dunlop), and taking full advantage of some multi-talented all-rounders such as Ian Snowdon, Darren Clark and Dean Lewis, as well as more specialised athletes, the club successfully held it’s own, often against bigger and better -resourced clubs. Margaret Watson was also busy coaching a talented group of sprinters – Bob Hollands, Ben Johnson, Dave McCulley, Ian Snowdon, Martin & Craig Telford. Ian MacDougall, George Williams and Darren Clarke – who helped to lay the basis of a strong squad. In 1987, the club won their Division, and in 1988 were promoted to again, to Division 2NE. After one or two fallow years, the mid-90’s saw a resurgent Wallsend Harriers team record some spectacular success in league, competition. A fortunate combination of talented distance runners (O’Gara, Lucas, Paul Merrison, the Morgans, Peter Saint), talented sprinters (Eric Smart, Phil Jones, Craig Telford, Dave McCulley, Ben Johnson) and talented all-rounders such as John Renney and Dave Brice (once the leading triple jumper in the area – before the emergence of Jonathan Edwards), delivered some huge success, with the club earning a place in the play-off match at Bolton for promotion to Division 1 of the North of England League. The early 90’s saw the club’s fortunes take a significant rise on track and field (as well as other disciplines) when the so-called ‘East Coast Elite Squad’ – many of whom ex-North Shields Poly members – of Peter Saint, Peter McDaid, Paul Merrison, Chris Naisbitt and Craig Haslam joined (or re-joined) Wallsend. Their experience, wisdom and aggressive competitiveness was combined with home-grown talent of the Morgan brothers, O’Gara, Lucas, Milligan and Atkinson to propel the club to new levels of achievement. Of this group, Peter Saint gloriously continued the coaching tradition established by Bill McGuirk when he began coaching Stephen O’Gara in the mid-1990’s. With Peter’s often unorthodox training methods beginning to bear fruit, O’Gara became Wallsend first-ever senior mens international athlete in 1997. The success of the 90’s was not to last, however, and despite much urging and cajoling, by 2002, it was becoming increasingly difficult to find sufficient numbers to muster a track and field team, and Wallsend only retained a connection with the T&F league by becoming part of a Tyneside Composite team, along with other clubs in a similar predicament. This was to last 2 years, before the club sadly ended 19 years of continued involvement with the North of England Track & Field League, and withdrew altogether. The club continues to compete at youth level, however, with an entry every year into the UKA YAL League (formerly the McDonalds). This again, continues a well-established pattern, as the club has consistently sought to try and nurture young talent into the more specialised disciplines of track and field athletics. Youth participation in track and field athletics has been a feature of the club since Bill McGuirk’s early years, with many athletes making the trek to Gateshead Stadium – walking across the Tyne Bridge in the pre-Metro years. Youth teams in the Track & Field leagues were wonderfully managed in the early years by McGuirk, Danny Lucas, Martin Telford, Tommy Morgan and – in recent years – Barry Allsopp. It was, however, the need for Barry to seek work (at the new Heathrow terminal) that ultimately led to t he club having to sadly withdraw from the National Young Athletes league in he summer of 2006. With Barry no longer able to coach at the club on Tuesdays and Thursdays, many of those youngsters at the club decided to leave, and there was insufficient support to continue a commitment to team competition. For Bill McGuirk in particular, the whole of the annual training cycle was about around the summer track season. Any other success – road or cross-country – was deemed a bonus by the acutely-focused coach. Traditionally, McGuirk’s athletes would be seen circling the Burnside field for two weeks prior to (and following) the track season as he sought to accustom legs to the shift in emphasis and running style. Over the past 30 years, Wallsend Harriers have – like all such groups – sought the best way to pass information around the club. The most tried and trusted method is the old-fashioned summons to ‘listen up’ on training nights – when news or the celebration of athletic success is shared among those present by the secretary or Chairman shouting out the facts while standing on a bench in the changing rooms. There have been other, more permanent, attempts. During the 1980’s, club member Sean Driver produced a club newsletter called ‘The Harrier.’ This was an impressive production, often containing 12-16 pages of news, results and gossip, as well as copies of photographs and newspaper and magazine clippings. Produced intermittently, the magazine now provides a fascinating retrospective insight into the club’s ‘boom’ years, of triumphant juniors and youths and the myriad of athletic activities pursued by senior members – cycling, fell-running, orienteering, ultra-distance running. 8) We give each other awards! For many years, the most prestigious award for club members was to win the annual Club Championships, a race of 6-miles held every Spring. However, in 1994, the club decided that the award should reflect more than road running, and an ‘Athlete of the Year’ award was instigated. Offering both a senior and veteran category, recent years have also seen the introduction of a ‘club member of the Year’ award to reflect non-athletic services, while the youth section also has an Athlete of the Year award. Along with the ‘Johnstone Cup’, the club’s Harrier League Grand Prix and, more recently, both a summer and winter Grand Prix series, the annual Presentation Night (usually at the Lindisfarne) is a busy evening as the club seeks to reward members for the hard work and dedication that is essential for success. It may be all about the athletes, their triumphs and their achievements, but for a club like Wallsend to survive and prosper, it also needs volunteers willing to take on the less glamorous tasks of organising and managing. In this respect, Wallsend have been lucky to have had volunteers throughout the past 30 years, every bit as willing as committed as the most successful athlete. Four men in particular were vital in laying the strong foundations for the club in the late 1970’s. Bill McGuirk was the first to answer the call and the first to have the vision of a successful athletics club in Wallsend. Doug Bramley, George Page and Albert Watt were quick to follow Bill’s lead and to willingly offer skills, energy and commitment to the club. Others followed: Terry O’Gara and Gordon Smith were vital in offering the club a character and personality that still endures, bringing a passion and pride in hard work and effort, but also rightly celebrating the joys of brotherhood and conviviality that sport can offer. Neither Terry nor Gordon were qualified coaches, and in Tommy Morgan, Dave Williams and Margaret Watson the club were lucky to find willing volunteers able to guide youngsters into and upwards through our sport. Margaret, along with Danny Lucas and Sylvia Fletcher (and both Doug Bramley and, recently, Tommy Morgan) have also offered their services to the wider athletics community beyond Wallsend, as graded officials, ready and willing to give up hours of their time to stand at track, road and cross-country events. With the likes of Alex Richardson and Ian MacDougall, the club have sustained a hard-working and diligent committee – Alex has been Treasurer since 1993 and no-one can remember the last time ‘Doog’ missed a committee meeting. Derek Craigie was vital in building up the club as a realistic proposition in track and field athletics, while John Jamieson has put untold hours into the club – John remains Race Secretary for the Wallsend road-races, as he has been for many, many years. There are, of course, many others – Dennis Waugh, Dave Haddon, Derek Brown, Barry Allsopp, Dave Anderson, Mick Baker, Martin Telford…the list could go on – all unsung and often unnoticed, but all essential in allowing Wallsend Harriers to endure. The same can be said for the hundreds of members who were not, for whatever reason, among those recording triumph and success in Wallsend colours. Our sport is unique in the challenges it offers the individual; medals and trophies are great, but for every runner there is not only the challenge of beating a rival, there is also the tangible and never-ending challenge against oneself. Whether that is the challenge just to complete an event like a marathon or half-marathon (how many of us still remember how difficult that seemed! ), or whether it is the challenge of shaving seconds or minutes off a personal best (how many of us know how sweet that is!) – athletics is the most glorious of sports in forcing us to face up to self-doubt and avoidance. Our club has had hundreds of members over the past 30 years who have run for definite and enduring reasons other than glory or success. This brief history may celebrate many of the athletes who have risen highest among us, but our club has been shaped and moulded just as much by the joggers, the fun-runners, the middle-of-the-pack runners and the strugglers. 10) We look to the future ! And what of the future? 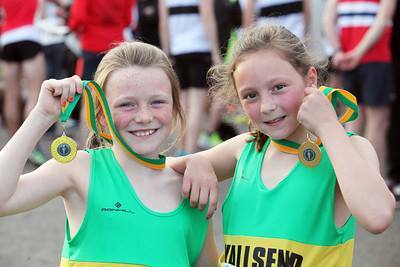 The past 30 years have offered much that benefited a small athletics club like Wallsend. High-profile international success by middle-and long-distance UK runners gave a massive boost to levels of participation, as did a more general social recognition of the benefits of regular exercise for adults. This, combined with a relative decline in the popularity of the UK’s national sport – football – and a generation whose diet and lifestyle offered a much larger pool of lean, slim adults and youths, was fertile ground in which athletics could flourish. As the club looks ahead to the next 30 years, it is difficult to see the re-appearance of such favourable circumstances. Football dominates the sporting world, for many young people ‘leisure’ is associated with passive activities – games consoles, computers, satellite television, the internet – fat and sugar-rich diets now produce bigger, heavier adults and, for those who still seek the pleasures of regular exercise – there are gyms, exercise centres, leisure pools, mountain-bikes. At the same time, the world has changed. Athletics is now a world-sport, and African nations completely dominate international distance running – it is now almost impossible to imagine a European male athlete achieving any sort of Championship success. This starves our sport of high-profile role-models, as the UK looks instead to sprinters and specialised field eventers. Nevertheless. there are signs of encouragement. Paula Ratcliffe’s success has undoubtedly introduced many women into distance running and club athletics, while the 2012 London Olympics offers the sport a marvellous opportunity to enjoy years of high-profile support and encouragement. This global context is reflected at club level for Wallsend Harriers. The number of women at the club has not been as high for many years, and some of them are beginning to enjoy local success. Nevertheless, there is little to deny that – among male members – veteran runners now dominate, as many individuals attracted into the sport during the ‘boom’ years remain emotionally committed to the sport. Stripping away much of the wider issues – the club’s future depends as it has always done, on the spirit, endeavours and commitment of it’s members, and in this sense there is much to be optimistic about with regard to Wallsend Harriers. The committee remains hard-working and united, the club still actively sustains the social side of athletes so essential to it’s health, and there is till a thriving , year-round, series of athletics competitions – the summer and winter Grand Prix can for example, attract over 40 entrants each year. As we look back over the past 30 years, and celebrate the achievements and efforts of so many people, it is fitting that we should also look forward with hope and optimism to many more years of then unique pleasures and satisfaction in being part of Wallsend Harriers. Authors Note: It is inevitable that in such a short record as this, many people have been missed and many contributions have been overlooked. This is not intentional. It is also likely that errors or distortions have been committed. If this is the case, apologies. The story of Wallsend Harriers continues and any clarifications or corrections (or challenges and disputations!) will be welcomed. Our thanks go to everyone who has contributed some part of their lives to our small club – and we look forward now to the next 30 years!